What are your API creations? We would love to hear about the creations you've made with our Public API! If you are a developer who's been using the API, please share your experiences in this post. I'm looking to collect the coolest and most creative constructions for an upcoming blogpost. Off-topic, but how would users be able to use this? They have to create an API key, and enter into the app? Or do they have to set up a 'Connect' with the app developers bunq account (your account) to be able for you to read the transactions? For now I'm only building that for myself because I'm not expecting (and actually don't want) people to enter API key in random single purpose apps. Will put the code on github as soon as I finished it so if you are an iOS developer with some node.js knowledge you could be able to use it. As I don't want to have my accounts cluttered with other peoples accounts the 'connect' way is not really an option for me right now. As a test/proof-of-concept i created a payment page, based on the "Payment request" (bunq.me) functionality. It shows the bunq QR-code, so people can pay with the bunq app. And it also can generate a iDEAL payment link. Are there more of you with creations? I'm still very curious to hear more. Hi Bastiaan, I need exactly this functionality. Did you use an SDK for this? And are you open to sharing the code? Hello Bo. I will put it on GitHub soon. Ah cool Bastiaan, thanks in advance! Now it supports bunq as well. A pre-release version with support for the bunq API is available for customers of MoneyMoney on request. Anyone else feel like sharing their API experiences? Currently working on a Python script that retrieves all account balances and stores them in a Google Spreadsheet. 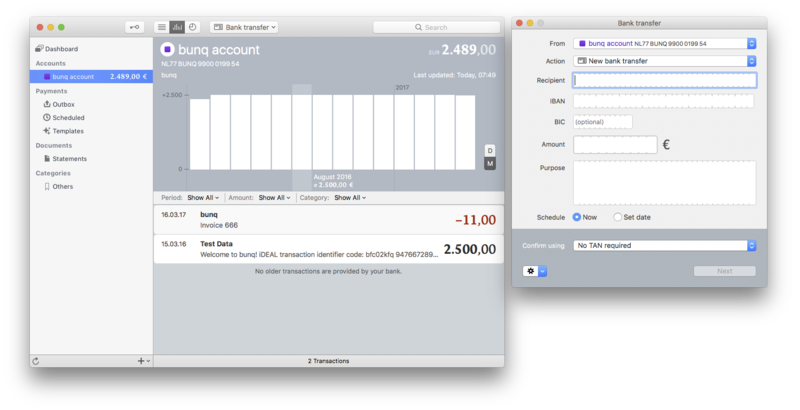 Will run daily so that I get a nice overview of how my balances change over time. Goal is to automate the process as much as possible which means creating new spreadsheets for each Month and creating graphs in them programmatically. Will post the code on GitHub someday. That sounds pretty amazing. Are you doing this in order to keep an eye on your spending behavior? Tried this just now. Works great, though the API pricing may be a downpoint for consumers. im doing something similar maybe we can team up and make something great ? On which days do I spent most. Do I spend more on the weekends on average than during the week. How much money is left per month on average. How much do I spent on food per week. How much do I spent on bought food (e.g. From Thuisbezorgd) vs self made food.